Posted on Sun, Nov 13, 2011 : 10:18 a.m.
Gov. Rick Snyder signed a law last week making it illegal for employees at educational institutions to collect unemployment during the summer. House Bill 4452 amends the Michigan Employment Security Act —Michigan's legal vehicle for unemployment benefits— to make it illegal for university or school system employees hired by a third-party contractor to collect unemployment between academic years. The statute states that if an employee has reasonable belief for employment in an upcoming term, they cannot collect unemployment benefits in between the term they last worked at the upcoming term. State Rep. Ken Yonker proposed the bill in response to potential abuse of the MESA by a growing number of education workers who are employed by third-party contractors. MESA already makes it illegal for a worker employed directly by an educational institution or government entity to collect unemployment during summer or winter breaks. However, the provision did not apply to third-party contractors. According to a House Fiscal Agency report, the bill "would reduce benefit payouts from the unemployment trust fund, by an indeterminate, but not likely significant amount." Tue, Nov 15, 2011 : 3:09 p.m.
UNITED STATES LABOR LAWS AND EDUCATION : Could I ask the writer to provide us some education and understanding of US Labor Laws. The State of Michigan may not have the freedom to enact a Labor Law that violates the Federal Law. This story describes a State Law that is discriminatory. People are entitled to equal treatment and in principle the Law must be applicable to all categories of employment. I am not concerned with the intent of this Law. I want to simply know the legal principle involved. Tue, Nov 15, 2011 : 12:58 a.m. The very idea, taking tax money from others when you know when you'll be working again; we already pay a big enough percentage of educators' health benefits for them. Both power grabbing ideas (politicians' lust for power of constituents and union bosses' lust for power over their union members) are unsustainable; the whole idea of a union-controlled business paying for their FORMER employees' health and retirement benefits should be the next practice on the chopping block; it's the most unsustainable of all. Tue, Nov 15, 2011 : 1:40 p.m.
1) Shame on the reporter and editor for allowing this title. Where has the integrity of journalism gone? It is obvious that the title does not reflect the article. 2) I would admonish the simpletons that appear not to have read the article but judging from their comments they are just ignorant and don't understand 3rd party contractors and make assumptions based on the title which is wrong. 3) As for the folks who praise Engler vs. Granholm let me tell you, taxpayors are still paying a double dip pension for Engler. In fact he collected his Senate pension while he was gainfully employed as governor of this state and is now collecting a pension for both Senate and Governor from the state. 4) Again this is a non-existent problem and only pertains to non-employees of the school systems who by the very nature of the position do not know if they will have a job in the next term. Also that third party contractor is most likely paying the unemployment insurance not the taxpayers. 5) Again report the facts and do some more research. Also do the follow-up to see what savings are accomplished and please write a front page retraction to this story and write it properly. This might even cost the state money due to them having to investigate this special class and also it might drive up the cost to the school districts since this class of employee is cheaper to the districts and this law might drive this options costs up directly to the district hence the taxpayers will be paying for it instead of the third party contractor. Mon, Nov 14, 2011 : 9:56 p.m.
Mon, Nov 14, 2011 : 5:40 p.m. It is about time, I can't believe it ever happened! I have some family members in the Ann Arbor Public Schools who have collected unemployment, in the past, over the summer, I am thrilled that that will stop. Those who take jobs that don't go throughout the entire year, know that when they take the job. Why should the taxpayers pay them to sit on their butts all summer! 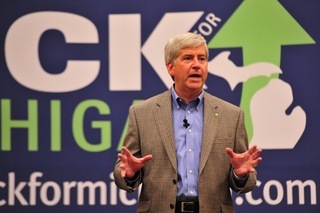 Thank you again Rick Snyder! Tue, Nov 15, 2011 : 12:37 a.m.
Spewing hate about a group of workers that have never collected unemployment in the summer is not a family value...at least among family members that claim that family member whose spewing that hate. Other than that...it's a great whopper of a lie over family dinner. Mon, Nov 14, 2011 : 7:18 p.m.
Mon, Nov 14, 2011 : 5:28 p.m.
EMPLOYMENT STATUS - &quot;AT WILL&quot; : If the employment status of any employee is &quot;at will&quot;, there is no expectation that the employee would be employed again by the employer if employment stops for any reason. The employee who lost employment is entitled to seek unemployment benefit as applicable until such time he/she gets a chance to resume employment with a former or a different employer. If there is no written contract between the employer and the employee, the expectation of resumption of employment has no legal basis. This Michigan law could be violation of U.S. Labor Laws that deal with Employment Status and Unemployment benefits. I am not an expert but the story fails the &quot;SMELL TEST&quot;. In fact, it STINKS. Mon, Nov 14, 2011 : 3:40 p.m.
Ann Arbor.com - Your fangs are showing. Your headline is so pathetic that you don't even try to hide your liberal bias. Mon, Nov 14, 2011 : 7:17 p.m.
Mon, Nov 14, 2011 : 1:50 p.m.
Mon, Nov 14, 2011 : 3:58 p.m.
Mon, Nov 14, 2011 : 12:21 p.m.
Snyder should pass a new law forbidding anyone to become a teacher, and then round up all teachers and put them into a WWII type internment camp like we did to Japanese citizens. This way he and his group of Republicans will finally be able to declare victory over their hated adversaries. Mon, Nov 14, 2011 : 12:08 p.m. I don't understand why these third party employees cannot collect if they are nort receiving income from their employer. Either the employer should find them work during their off season or pay unemployment. This doesn't sound like double dipping to me; unless they are getting paid. All seasonal employees need that money during the off season; the people who build our roads come to mind. Mon, Nov 14, 2011 : 12:01 p.m.
Wow! The GOP seeks out a problem that nobody seems to have any statistics about so we really don't know if this was a problem at all. Then they single out ONE profession for punishment, for a problem that does not seem to be a problem. This is just sad politics. STUNSHIF-&quot;Very sad that this new law is even necessary and shame on the jerks that have been abusing the system. &quot; Do we know that it was necessary? Do you know if their has been abuse? If so, how many people were abusing the system? Is this like Anchor Babies or Iraqi wmd's? Mon, Nov 14, 2011 : 10:50 p.m.
Mon, Nov 14, 2011 : 5:17 p.m. If it was not a problem, then the law won't adversely affect anyone. So nobody loses -- hooray! You can be thankful the legislator who spent time drawing this up didn't devote his energies to something that you would have liked even less. Mon, Nov 14, 2011 : 11:48 a.m.
Have never heard of any school employees collecting unemployment. In fact, the salary can be taken two ways -- 22 pays, and none in the summer or a total 26 pays which is year round but smaller. Mon, Nov 14, 2011 : 8:25 a.m. While it is great and all that we are finding ways to put our tax dollars to better use, I would like to disagree with many of the previous views expressed on this topic. Yes, it would be extremely selfish for a seasonal worker who didn't need the money to survive to reap unemployment benefits, but what about the many teachers that do? Let's look at the facts here. We all know that teachers often don't get paid very well due to many budget cuts in numerous school districts. We know that many teachers, especially those that are being employed by third party contractors, do not get paid during certain seasons of the year. Putting those two elements of the equation together seem to point to possible necessity for unemployment benefits. Instead of simply making it illegal, I believe that Snyder should have thought of a plan to give unemployment benefits to teachers based off of personal economics similarly to FAFSA for college students. Plus, if teachers can't be given benefits when they aren't teaching, who's to say that those who run snowplows in the winter can't be entitled to benefits in the other seasons as well? There are many seasonal positions in our society that could be many citizens' only source of income, and I think it's silly to instantly label all of them as being inherently evil for wanting something to live off of when they aren't working. Jon Faber Undergraduate student of Calvin College studying Mathematics and Education. Mon, Nov 14, 2011 : 5:13 p.m. I happen to think teachers should be paid considerably more, along with reforms to ensure higher standards and easier removal. It is an extremely important job and one that deserves both good pay and high expectations. But unemployment insurance is not the mechanism to slip underpaid teachers a bit more money. It is a matter of setting their salary. Mon, Nov 14, 2011 : 12:06 p.m.
Unemployment insurance is not a gift from the people of Michigan. It is paid by your former employer. Seasonal construction workers accept lower pay in order to collect unemployment during the winter. Full time teachers accept lower pay in order to collect a pay check in the summer. In both cases, someone saves up money for them while they are working and passes it out when they are not. Or maybe we should modify the socialist plan - to each according to his greed. Mon, Nov 14, 2011 : 6 a.m.
Great Guv, still trying to slap the teachers around! NO CONTRACT UNION TEACHER EVER GETS UNEMPLOYMENT! As another reader said, this is for the third party workers that don't get a decent salary, no benefits, no (or minimum) healthcare, and aren't assured of a job in the fall, why not allow them to get unemployment? Mon, Nov 14, 2011 : 4:37 a.m.
Micromanagement &amp; needless laws seems to be the top priority of the repubs ...especially when it's not targeting their friends in the upper levels of public works. Hey Synder &amp; repubs, I wait in anticipation for you to create a law that states that if you collect retirement about 50K a year from the state you can't be hired by the Governor of that State for a state government job that makes over 50k. If so, then you can't collect retirement during that time and your current job can't go towards future retirement payouts. I also wait for you to penalize/prevent those same folks from even taking a state government job similar to what you &amp; your buddies now require of all state workers who get an average of 20K a year from retirement. If you make this happen, then maybe you &amp; the repubs can stop all the purging of that massive amount of state retirement funding from going to Engler and others. Mon, Nov 14, 2011 : 4 a.m.
How was this practice EVER allowed by state law!!!!??? GRANHOLM: The disaster that keeps on giving!! Mon, Nov 14, 2011 : 1:45 p.m.
Mon, Nov 14, 2011 : 4:09 a.m.
What practice are you raging about? Sun, Nov 13, 2011 : 11:12 p.m. I'm not sure if anyone else finds this highly suspicious, but I sure do. What is the purpose of trying to pass a law that would fix an almost non-existent problem? The article also states that it would only save a &quot;not likely significant&quot; amount of money. With everything else Snyder has been doing to crush public education in an attempt to boost the revenue to charter schools, I suspect that this is the beginning piece to a much larger plan for his buddies. Sun, Nov 13, 2011 : 10:44 p.m.
Sun, Nov 13, 2011 : 10:11 p.m.
My fiscal investment in the Snyder campaign is paying significant dividends. Money that is not given to workers is money that can be given to me. Sun, Nov 13, 2011 : 10:08 p.m.
My fiscal investment in the Snyder campaign is paying significant dividends. Money that is given to workers is money that can be given to me. Sun, Nov 13, 2011 : 10:03 p.m. Nothing like passing a new law that pretends to fix a non-existent problem that is _only now_ being fixed only due to our new Dear Leader. Anything to build animosity and cater to the crazed wingnuts, eh? Sun, Nov 13, 2011 : 9:24 p.m.
No one is even getting that this would just be stopping only the Substitute teachers who barely make anything thing and then get nothing for work all summer long. No sick days ever, no paid vacations ever, no raises for the last 15 years that I know of and if you don't work you don't get paid. And not even talking about the fact you don't technically have a job the next day. You are a day laborer like what they have in California. Mon, Nov 14, 2011 : 2:52 a.m.
We have day laborers here too - they're not just in CA. Mon, Nov 14, 2011 : 1:27 a.m.
@Marilyn Wilkie: Subs in AAPS are hired by a 3rd party (PESG). As JB stated there have been no raises for the past 15 years. They know what they get into, however, with no promise of a job the next day. Given that on average the typical public school student will have a substitute teacher 1/12 of their total time spent in public school (stats provided by AAPS) it would make sense to consider better reimbursement. I don't , however, find it appropriate to support them claiming unemployment over the summer as they are contractual by definition. Mon, Nov 14, 2011 : 12:30 a.m.
Are substitute teachers hired by a third-party contractor? If not, what's the problem? Sun, Nov 13, 2011 : 8:11 p.m.
Ms. Whitehouse, The article headlines on the teacher and unemployment is very upsetting. Teachers have not and do not collect unemployment during the summer. The headlines should have read teachers hired by 3rd party employers are not allowed to file for unemployment. Once again your article feeds the public concept that teacher are only in for the money and part time work. You have done every teacher an injustice by the headlines of this article. Since people usually believe what they read the ones that don't read the article will assume that teacher have been getting unemployment all summer long, which is a false statement. Teachers are taking a hard hit from a lot of the public and this sure does not help. If a person reads the article it is the teachers hired by a 3rd party that are trying to beat the system by filing for unemployment. I do believe that this very irresponsible of you to not report the issue correctly in the headlines, unless you were trying to make teachers look as if they only cared about money. Sun, Nov 13, 2011 : 7:01 p.m. It has been at least 25 years ago that we were told that about why they stopped unemployment for school employees. And that happened quite a few years before that, so probably very few know of teachers that got paid and drew unemployment since it was probably over 30 years ago. Does anyone know how or where we could look the facts up on this topic? Sun, Nov 13, 2011 : 10:04 p.m.
Name and address of the infidel have been recorded. Sun, Nov 13, 2011 : 10 p.m.
Let's not let facts cloud our judgment. If there was an opening for it, it was being abused. The mere potential of ongoing loss is enough of a cause to close the door on it. Good job, Guv'nah! Sun, Nov 13, 2011 : 6:27 p.m. I know there's a ton of anti-union bloggers here, so no matter what is done against teachers and public employees, they're all for it. First, let me say this... if this is being done, then I'm all for an end to it. But I'd really like to see stats on how many teachers are ACTUALLY doing this. Second, if Snyder wants to attack unemployment abuse, great. How about drug addicts that refuse to get a job while we pay for them to get high. How about people that REFUSE to get a job because they figure they can make more sitting on their butts while we all go to work. Yes, let's stop the abuse, but let's focus the attention on the TOP offenders first where the greatest benefits can be realized for the unemployment system. I too have a lot of friends that are teachers, and no one was aware that this was even an issue. Let's keep in mind that with the new craze of 'out source everything' that you get employment uncertainty. &quot;The statute states that if an employee has reasonable belief for employment in an upcoming term, they cannot collect unemployment benefits in between the term they last worked at the upcoming term.&quot; If a teacher is flat out told that they will be coming back next year, there's no way I'd support them collecting unemployment. But really??? This is where Lansing efforts are being focused? Go after the real problems out there. Then let's focus on cleaning up the little pieces. Sun, Nov 13, 2011 : 6:45 p.m.
How about reading the article before spouting off! Are teachers hired by Third Parties? I think not. Sun, Nov 13, 2011 : 6:13 p.m. The headline is misleading. It should include &quot;hired by a third-party contractor&quot;. Leaving that out makes it much more controversial and suspect. Sun, Nov 13, 2011 : 5:24 p.m.
Our support staff was told by our district that the reason they couldn not collect unemployment in the summer was that so many teachers were on salary and getting paid in the summer, but still applying for and recieving unemployment. When the Federal govt. caught that, they stopped ALL school employees from drawing it. This was many, MANY years ago. That IS what we were told. Is there any common sence left? Of course if your salary and getting a check that should disqualify you. But what about the support staff? They cut their hours as much as they can, they lose two weeks pay at Christmas and a week at Easter, then lose two and a half months in summer, along with many days off per year for unpaid to them inservices, winter breaks, ect. Then the districts cry they can't get quality support staff. Well, a good working person that has to live and most support families can't afford the luxury of losing that much pay a year. The last I checked, the support staff still had to pay their mortgage or rent in the summer, all their bills, and believe it or not---their kids still eat in the summer too! Some districts have a summer payment plan where they take a percent of your wage during the school year and spread it over 5 checks in the summer. That may keep your kids from starving, but sure wouldn't pay all the bills. It is sad, so very sad that a group of people working and struggling to earn a living get treated so poorly, while the people that have never attempted to work and could care less about having a job get their checks year round. Sun, Nov 13, 2011 : 5:15 p.m.
One step closer to that awesome jobs plan! Sun, Nov 13, 2011 : 5:10 p.m. So can construction workers still collect during the winter months? Friend of mine did that every winter when there was no work digging basements. Very odd if so to single out this one group? Sun, Nov 13, 2011 : 11:01 p.m.
Construction companies pay a much higher rate of unemployment insurance than other industries. They have not been singled out, it is based on a legitimate need to give construction workers something to live on during the off season. Most return to work when the weather improves, so everything washes out. Each company is responsible to pay back the unemployment insurance benefits for its laid-off employees. So in this case the education contract houses save money, not the state. And teachers who gain permanent jobs don't return to the contract houses to work off their summer of unemployment benefit. There are so many more temporary workers than in the past, that's why they needed to patch the law. Too many found the loophole. Sun, Nov 13, 2011 : 7:02 p.m.
Gotta start somewhere. Let's hope they keep going! Sun, Nov 13, 2011 : 5:25 p.m.
Sun, Nov 13, 2011 : 4:51 p.m.
Additionally: According to a House Fiscal Agency report, the bill &quot;would reduce benefit payouts from the unemployment trust fund, by an indeterminate, but not likely significant amount.&quot; So why bother if it's not likely significant? Maybe to make a political point? Mon, Nov 14, 2011 : 1:04 p.m.
&quot;So why bother if it's not likely significant? Maybe to make a political point?&quot; Could it be that some of us actually care about what's right and wrong? I realize this concept doesn't come in to play during Democrat administrations, but it is important to some of us. Sun, Nov 13, 2011 : 5:16 p.m. If the government is paying attention to details, including items (such as this law) that, taken alone, may be &quot;...not likely significant...,&quot; perhaps as an aggregate all of these details may indeed add up to a significant amount (apart from any considerations of fairness). Sun, Nov 13, 2011 : 4:45 p.m. This law only has an effect on the Temporary Contracted workers. Right? These people earn less than any regular employee and they are not in the union. The contracting company pays the unemployment insurance - not the school district. They won't reduce their fees with the school districts, will they? So taxpayers save nothing. The war on teachers unions doesn't score a point either. I have worked for 4 different contract houses and they take apx. 1/3 of the contract fee to cover expenses like this and they make money. That's $10 or $15 an hour to the contract company. They usually don't pay holidays or vacation. No sick pay. No layoff severence. No assistance with healthcare premiums. So the union haters slap down the lowest paid temporary workers and gave a raise to the contract house. Sun, Nov 13, 2011 : 4:35 p.m. The comments suggest that nobody read the article. Union teachers have never collected unemployment in the summer. As the article says: &quot;MESA already makes it illegal for a worker employed directly by an educational institution or government entity to collect unemployment during summer or winter breaks. However, the provision did not apply to third-party contractors.&quot; This specifically addresses employees of third party contractors, not regular employees. But I don't see how this is even legal. If you outsource food service, transportation, etc. then those employees work for the contractor, not the public entity. Are we going to next make a law that says auto workers can't collect unemployment during retooling? Whose business is that anyway? Sun, Nov 13, 2011 : 7:05 p.m.
Hey, if government money is going to anyone, it's all of our business. Sun, Nov 13, 2011 : 4:33 p.m.
&quot;Potential abuse&quot; Can we be really sure this was done in the interest of the state or instead the appetite of the guv to have positive media running at all times? This guy can look you straight in the face and tell you Godzilla was just an aphasic with bad breath. Mon, Nov 14, 2011 : 6:39 p.m.
Claims of mystic in points well made is the best flattery there is. Don't you have any other techniques? The Snyd' agenda speaks for itself -unless that is a puzzle, too. The GOP is not exactly a balance of limited powers, even on a good day. Nice try though and thanks for the attention. Mon, Nov 14, 2011 : 5:03 p.m. It's not clear why you're making this about the governor (though I suppose we can guess). As the article notes, he did not propose this legislation, a legislator did. In this case, it came to his desk and he had to sign it or not. Media attention likely would have been bigger if he had not. So his alleged appetite for any type of media likely had precious little to do with this action. Mon, Nov 14, 2011 : 3:24 p.m. Sorry comp. If anyone could finally uncover some sort of experience in this, his only, public service to permit an honestly positive comment him, it would be as thrilling -if not a new world wonder. But this is Richard Dale Snyder. The corn-dog don't slide off that stick. Pledge of Allegiance legislating, child weight data bases, ect...? Now this? No jobs, no protection of the public welfare or constitution. Michigan needs the latter like a second gubernatorial campaign debate. Mon, Nov 14, 2011 : 2:36 p.m.
Can we be really sure if your comment was really about the story or your appetite to say something negative about the governor? Sun, Nov 13, 2011 : 6:44 p.m.
What difference does it make. Are you for or against the new law? Sun, Nov 13, 2011 : 3:50 p.m. I know lots of teachers how would brag about doing this. Shame on them. Any they wondered why few supported their union fight. Mon, Nov 14, 2011 : 3:37 p.m.
Joe, You are so wrong! Why do you dislike teachers so much? Sun, Nov 13, 2011 : 4:55 p.m.
Sun, Nov 13, 2011 : 4:47 p.m.
&quot;MESA already makes it illegal for a worker employed directly by an educational institution or government entity to collect unemployment during summer or winter breaks. However, the provision did not apply to third-party contractors.&quot; Joe.blow is blowing hot air. Sun, Nov 13, 2011 : 4:42 p.m.
Are you just making things up Joe? It is already illegal for teachers to collect summer unemployment. You don't know anybody who brags about this because they can't do it. Sun, Nov 13, 2011 : 3:46 p.m. I know litterally dozens of teachers, my wife is a teacher, most of my family are teachers, lots of buddies wives are teachers etc. I have never heard of a teacher collecting un-employement while off in the summer. Most teachers I know, my wife included has her paychecks spread out all year long, not just the school year. That said it is sad that here has to be a law against this and to those that double dipped the system in the past, shame on you. To those who try in the future, hope you lose you job as you are not the type of person I want teaching my children. Sun, Nov 13, 2011 : 3:31 p.m.
Sun, Nov 13, 2011 : 7:09 p.m.